Help parents celebrate & remember baby's important "Firsts" in classic style with this adorable set of pink or blue & chocolate brown dot ceramics. They'll think of you as they use the "My First Curl & My First Tooth" boxes, the "My First Photo" frame, and the "My First Piggy Bank". 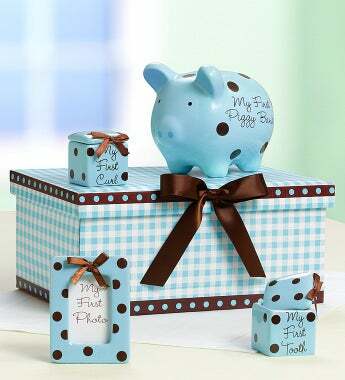 And the keepsake box will be the perfect spot to store their cherished baby mementos!